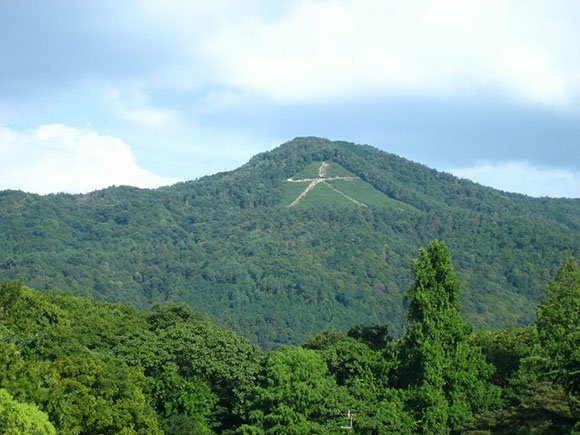 Nyoiga-take is another name for the famous Mount Daimonji which is to the north of Kyoto. A popular spot for hikers and walkers, this attractive mountain offers amazing views over the city of Kyoto, especially on clear days, and is surprisingly accessible to hikers of all ages and abilities. While there are a number of different trails which can be followed, the route from the trail head at Ginkakuji is the best option for novices and families, and offers an easy 30 minute climb to the fire bed which takes the shape of the kanji character “Dai” or “big”. The Daimonji Bonfire festival is held in August and sees enormous Chinese characters depicted by fires being lit up to mark the end of summertime. This famous spectacle draws visitors from all over Japan and from around the world, and there are many excellent viewing spots where the characters can easily be seen. One of the best spots to view the fires on Nyoiga-take is from the banks of the Kamogawa River, although for those who want a more panoramic view, the high point in the Funaokayama Park (which can be entered free of charge) is the perfect place to be.